VoltAir System has extensive experience of custom integrated units and is the market leader in this segment. ZIZE-s can be fully adapted to your project, its specific conditions and the specified performance requirements. The modular design of the PolyCross® heat exchanger comprised of cassettes can be tailored to lower/higher or shorter/longer sizes to ensure maximum thermal recovery within the given area. Moreover, the design of the unit components – fan parts, filter parts, coils, controllers and so on – can be tailored into the optimal solution. 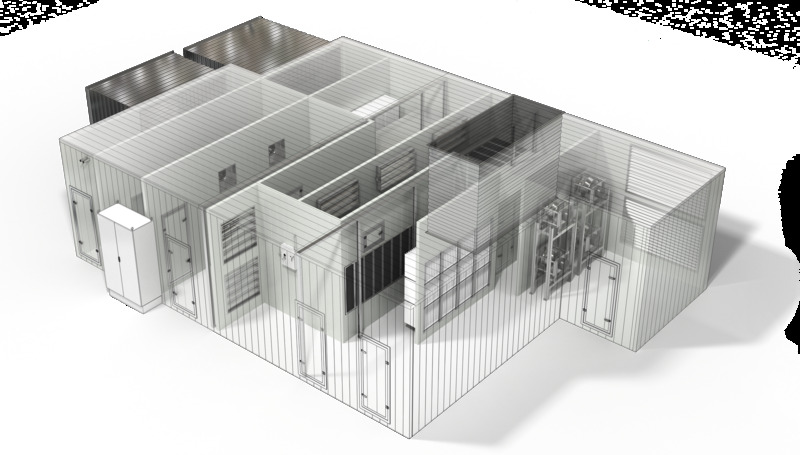 Such solutions are designed in a CAD environment by our experienced technical support department, turning ideas into realities in which our own fitters assemble the units on site. Just like the other ZIZE series, the ZIZE-s is designed to deliver the most favourable life cycle costs and reliability. At the heart of the unit is PolyCross®, our proprietary two-pass two-step cross-flow heat exchanger. With balanced air flows, this heat exchanger is capable of achieving thermal efficiencies of up to 95%. Moreover, the need for defrosting is significantly reduced due to the size of the heat exchanger and the component material's low surface roughness and hydrophobic properties. Naturally, fewer defrost cycles means lower energy usage. The size and volume of the heat exchanger results in a laminar air flow through the exchanger, in principle the entire air flow area. This means favourable thermal recovery even with very low air flows, the optimal solution for a VAV or DCV system. The fans are based on EC technology and the overall result is a highly favourable LCC calculation and minimal environmental impact. Assembling the solution on site allows the material to be carried through passages as narrow as 60 cm and with ceilings as low as 190 cm. Areas that with any other solution could not be used as utility rooms are thereby made available. Not even permanent obstacles, such as basement pillars, prevent a ZIZE-s installation – we simply integrate the pillars into the unit design. Being able to fully utilise otherwise unusable areas opens the way for other, more attractive areas of the building to be utilised as income-generating leasable areas. Combined with high efficiency and a low SFPv, this ensures highly favourable life cycle costs. The two-step cross-flow heat exchanger has completely separate air streams and is suitable for all types of buildings, especially those where odour transfer must be ruled out. Aside from standard functions such as supply and exhaust air, heat exchange and filtration, a number of other functions are available. Essentially, the only limits are those of your imagination. Since ZIZE-s units are custom-made, they are individually sized by our technical support department. Contact your nearest sales office for a consultation. Relevant documentation for the ZIZE-s series can be found here.